Wales has more castles per square mile than anywhere else in the world. So, whether your interest is in the early Welsh strongholds of the Princes of Gwynedd, the might of Edward I's fortresses or Victorian gothic, we've got it all and your friendly, qualified guide will bring the history and architecture to life! At the end of the thirteenth century, the Welsh took a leaf out of the Norman book and Dolbadarn Castle, Llanberis constructed stone fortresses for themselves. Dominating the pass of Llanberis this Welsh castle was probably built by Llywelyn ab Iorwerth (The Great) and his grandson, Llywelyn ap Gruffudd (The Last), imprisoned his elder brother Owain Goch (Owen the Red) there for 20 years. His younger brother Dafydd, lived there before the Earl of Pembroke captured the castle for Edward I. But it was back in Welsh hands again in 1401 when Owain Glyndwr imprisoned his enemy there. With magnificent views of Snowdon, the crags of the Llanberis Pass, the beautiful lake of Padarn and the sessile oaks of the surrounding woodland - this castle's got it all! Let me show it to you. Edward I defeated Llewelyn ap Gruffyd - the last Welsh prince of Wales and, in 1283, Caernarfon Castle began this, the strongest link in his iron ring of castles around the Welsh princes' heartland. With it's nine towers, two great gatehouses and huge curtain walls banded with different coloured stone it certainly awes with the strength and majesty Edward wanted to project. It has a rich history too from the proclamation of Edward I's son - the future Edward II - Prince of Wales to the modern investiture in 1969 of Charles. The walled town, docks and Roman fort make the town a fascinating place to spend at least half a day. This dramatic neo-Norman fantasy castle near Bangor was built by Thomas Hopper between 1820 and 1845 for the wealthyPenrhyn Castle, Bangor Pennant family, who made their fortune from the three S's -Sugar, slaves and slate. 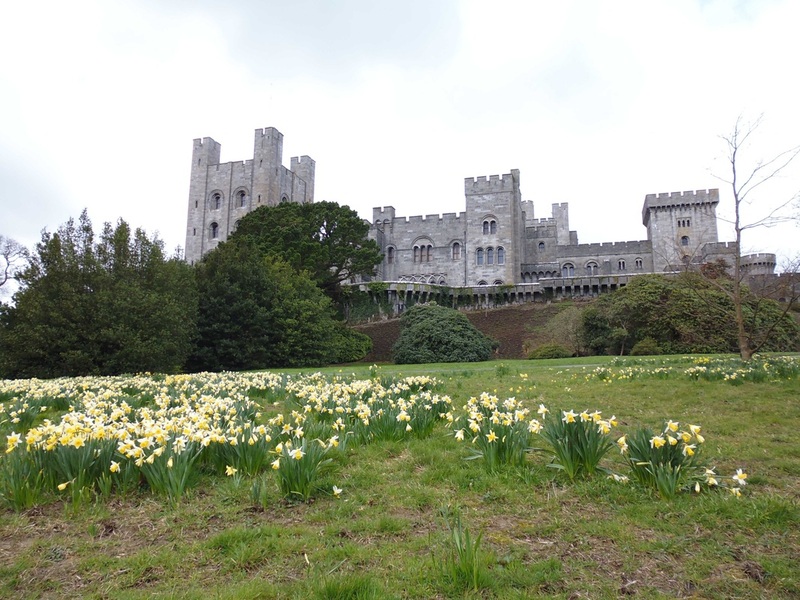 Hooper also designed its interior with elaborate carvings, plasterwork and mock-Norman furniture and the castle is crammed with fascinating things such as a one-ton slate bed made for Queen Victoria and an outstanding collection of paintings. We can also explore the extensive parkland with an exotic tree and shrub collection and a Victorian walled garden. Nestling in the beautiful Conwy Valley, Gwydir was built by the illustrious Wynn family c1500. Gwydir is a Gwydir Castle, near Betws y Coed fine example of a Tudor courtyard house, incorporating re-used medieval material from the nearby dissolved Abbey of Maenan. Additions date from c1600 and c1826. The house and gardens are undergoing restoration by its enthusiastic young owners, most notably the re-installation of the important 1640s dining room paneling, recently returned from the New York Metropolitan Museum.